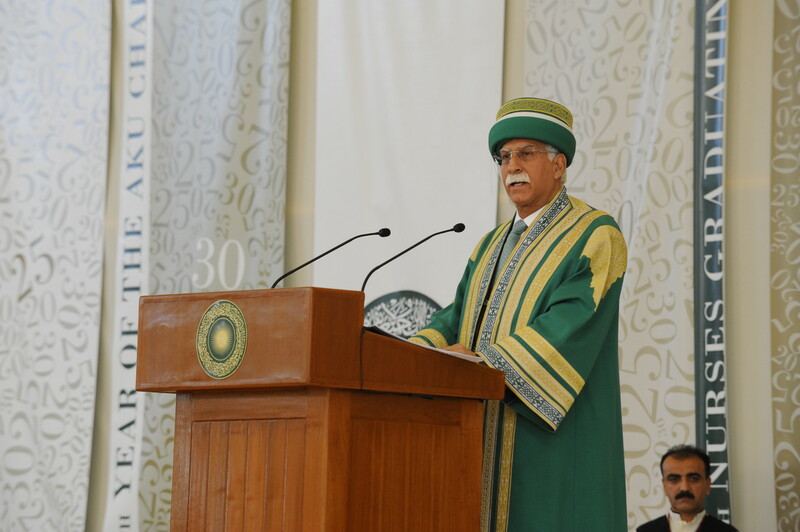 AKU’s President Firoz Rasul addresses the Convocation. Welcome to the 2013 Convocation Ceremony of the Aga Khan University. This year’s Convocation has special significance, for today we mark the 30th year since AKU was granted its charter, the 30th graduating class of the School of Nursing, the 25th graduating class of the Medical College, the 20th anniversary of the Institute for Educational Development and the 10th anniversary of the AKU Examination Board. This is truly a day of milestones, and a day of celebration. Graduands, it is above all you and your achievements that bring us together on this day. We have demanded much of you, and you have proved yourselves equal to every challenge. On behalf of all those assembled here, I congratulate you. I know that in the years ahead you will make this University, your families, your communities and your country very, very proud. At the outset I would like to express my profound gratitude to the faculty and staff for their commitment to the success of the students, our services and research; to our donors for their unwavering support; to the international donor agencies for their funding and partnership to make an impact on the quality of life of the people we serve; our university partners around the world for their readiness to collaborate for the growth of knowledge; and finally to the government for its encouragement to develop the higher education opportunities in this province and for this country. Convocation is a time to look back, to all that has brought us to this point, and to look ahead to the fulfillment of our ambitions. It is a time to recognise both individual excellence and the communal investments that enable each one of us to flourish. This day offers us a place to pause and reflect amid life’s onward rush. As we cast our gaze over the past, present and future, one conclusion is unavoidable: Our world is changing with extraordinary speed. One no longer needs to reach old age to find the world of one’s youth almost unrecognisable. And when we contemplate the future, only this seems assured: That it will be as different from the present as the present is from what came before. On a day such as this, in a world such as this, it is only natural that we ask how we can navigate the immense challenges we face and seize on the no-less extraordinary opportunities. My answer is this: By striving each day to help lead our societies create better lives for all in the midst of this unfathomable change. In a globalised world, change is inevitable, and always just round the corner. Whether it is for good or ill, whether it is change of our choosing or someone else’s, whether we will be its masters or its servants – depends on whether we act as leaders, followers or spectators. Undoubtedly, leadership requires an array of skills and traits. One must be deeply invested in a discipline, yet broadly educated and able to view problems from a range of perspectives; be an incisive analyst; be a clear communicator; have a strong social conscience; embody the highest ethical standards; inspire the best in others; and understand humanity’s diversity is one of its greatest strengths. Yet such capacities, while indispensable, are not sufficient. For at the core of leadership lies a restless desire to accomplish that which has never been done before, and the willing assumption of responsibility for the success of others. Today, there is another trait that a leader must possess: The conviction that the pursuit of knowledge through intellectual inquiry is key to progress. Regrettably, in the Muslim world, this conviction has seemed less important or prominent in recent decades. It was not always thus. For much of its history, Muslim societies have been at the cutting edge of science and innovation. In mathematics, from a long list dating back to the eighth century, we might mention al-Khwarizimi, whose name gives us the word “algorithm” and whose work introduced algebra (or Al Jabr) to Europe; al-Khayyam, who made many important discoveries in algebra and geometry; and al-Buzjani, a pioneer in trigonometry. In medicine, we can cite Ibn Sina, known in the West as Avecinna, whose Canon of Medicine was for over five centuries among the world’s most influential medical works. And Ibn al-Nafis, who provided the first-ever description of pulmonary circulation. Ibn Rushd, otherwise known as Averroes in the West, will be familiar to some as the enormously influential commentator on Aristotle. But we could also mention the astronomer al-Biruni, who in the 11th century argued, in a strikingly modern spirit, that observation and mathematics disproved Aristotle’s physics. If I draw attention to this history of leadership, it is not to dwell upon its loss, but to assert that an even brighter future is possible. In fact, it is to help lead the way up to that future that AKU was founded. Today, we can cite many examples of our success. The Higher Education Commission of Pakistan repeatedly has named AKU as the number one medical university in the country. We now operate the only teaching hospitals in Pakistan and in Africa accredited by the US-based Joint Commission International, which constitutes the gold standard in hospital quality around the world. AKU’s research leadership is demonstrated by the trust that has been placed in us by world-class institutions and organisations. In recent years, the World Health Organization has accorded our faculty a leading role in forging global agreement on the most important interventions for reducing maternal and child deaths; a global action plan for combatting several key childhood illnesses; a global framework for promoting investments to enhance human development; and global recommendations for the use of community and mid-level health workers to achieve better health for all. By their actions, both the national and provincial governments of Pakistan have made it clear they view AKU as an essential source of expertise. The Institute for Educational Development has played an important role in the development of the National Education Policy and teacher education reform, aided in the improvement of a number of teacher education institutions and built research capacity at public universities. Our Medical College and School of Nursing and Midwifery have been chosen to help upgrade public-sector medical and nursing schools, while our own nursing curriculum was selected to serve as a template for the national nursing curriculum. The AKU Examination Board was recently commissioned to develop a new course that will enable aspiring educators at 19 universities in Pakistan to implement effective testing and evaluation techniques. As these examples demonstrate, at AKU we believe that true leaders strive to enable others to fulfill their full potential. Perhaps the best evidence of our leadership is the track record of our alumni. Throughout Pakistan and many other countries, they are the pointing the way forward. Our nursing graduates lead many of Pakistan’s nursing schools and serve as chief nurses in several hospitals. Graduates of our Medical College have established new disciplines in Pakistan, such as emergency medicine, while raising standards in many others – every day, lives are saved as a result of this. If the Institute for Educational Development has been influential and effective in raising educational standards, it is to a large extent because of the many alumni who serve on its faculty and in senior academic and management positions in public and private educational systems. So Graduands, today you take your place among the more than 10,000 doctors, nurses and teachers who have been educated at AKU and gone on to make a difference. You have all passed many times through the marble portals to our campuses, whose grandeur speaks of the importance of the quest for knowledge. Now, you stand on the threshold of a portal that is not visible to the eye, but which is even more magnificent than those around us: It is the portal to the world itself. A quarter century ago, a young woman sat where you sit now. Her story was recently recounted in the pages of one of the world’s leading medical journals and newspapers. A member of our Medical College’s first graduating class, she listened, as you are about to listen, to our Chancellor. She heard his message of service, and never forgot it. After pursuing further training at some of the finest institutions in the West – training, I might add, that is now available here at AKU – she returned to her country and her alma mater. Dr Anita Zaidi has since gone on to become one of Pakistan’s most outstanding leaders in the field of paediatric medicine. Many of you have benefitted from her expertise. If I single her out for mention, it is only because of the timeliness of her latest achievement. Just last week, it was announced that she was selected from 550 applicants in 70 countries to receive a $1 million grant to fight child deaths in the fishing village of Rehri Goth. There are many such examples of extraordinary achievement of our graduates. I urge you to follow in the footsteps of all of our graduates who are working for the betterment of others. I urge you to bear in mind the example of this University, which was founded in the hope that its alumni would serve the interests of all humanity. I urge you to stay connected with your University, so that you and AKU can work together in realizing the vision set out by our Founder. Today we are deeply honored to have with us a leader who is responsible for the existence of this institution. Ladies and gentlemen, please join me in welcoming our Chancellor, His Highness the Aga Khan, who has led us to the summit upon which we stand today, and who has never ceased to focus on the still higher peaks that remain to be surmounted.